The one year anniversary of publishing my debut novel, KILLER INSTINCTS, came and went earlier this month without me even realizing it. However, I wanted to take a moment and reflect on the last twelve months, and provide a few observations. In 12 1/2 months I've sold a little over 600 copies - roughly an average of 2 a day. However, 60% of those sales occurred in the last three weeks of April, after BookGorilla caught on to my free Ebook promotion of the title and passed it along to their subscribers, resulting in almost 12,000 free copies going out the door in 3 days. In May sales dropped VERY quickly down to 50 copies sold that month, and I'm estimating about two dozen sales for June. In the months leading up to April, the best I've ever managed was 30 sales in one month, and that was right around the time I started with Amazon Select and doing free promotions. So, essentially the only way this title has been able to stay active has been through the use of promotion "bumps" in visibility, which have to be constantly repeated to get any continuous sales figures. Doing some vague napkin math, I've had to give away about two dozen copies of KI for every sale. On the more positive side, the book has gotten some really solid reviews. The lone two-star Amazon review is so insubstantial as to really give no more than a "Meh...", and I'm fully aware that the book isn't going to appeal to everyone. Beyond that, even the 3-star reviews are generally positive and expressed enjoyment, with a few quibbles here or there. In general, people seem to like the writing, enjoy the action sequences, and dig the characters, even when the whole plot seems a little "unrealistic". I'll take that as a win overall. I've also had strong support for a sequel, something I hope to begin working on at the end of 2013. It helps to have friends. When the novel came out, I'd already had a strong support base from people on Twitter and Facebook, as well as other bloggers and writers, both amateur and professional. Guys like James Reasoner, Brian Drake, Mark Allen, and Stan Mitchell - writers who have their own fan bases who both read their books and their blogs - helped spread the word and provide me with some great reviews. On the other hand, Operation Arrowhead was very quickly outselling KI without any of that exposure, so great reviews by guys who see substantial blog traffic don't always equate directly to sales figures, except perhaps as a temporary "bump". Ultimately, I see KILLER INSTINCTS as a sort of art-house project of mine, something that gets critical acclaim, but without any real financial success. I think it is a "better" book than either of my Commando novels, but clearly it is not carrying a proportionate degree of financial success. If time "on the shelf", as well as the number and quality of reviews was a direct indicator of sales, KI should be blowing both my Commando novels out of the water, while the opposite is true - heck, my short story "The Train to Calais" vastly outsells KILLER INSTINCTS these days. If $0.99 titles had the same royalty percentages as $3.99 titles, I'd make more off that one short story than I do from KI in every month save April. And so, that's where we are. 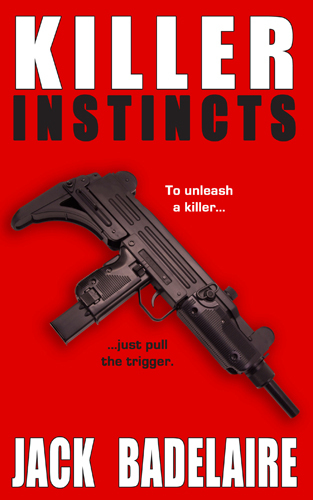 I am certainly glad I wrote KILLER INSTINCTS - I felt it was a story I had to tell, and the characters and "world" it created not only influence the Commando novels, but will influence many other stories to come. However, its mediocre success compared to my other works did cool my enthusiasm for writing a sequel, which is why I have a number of projects I want to write first, before I return to work alongside William Lynch again. 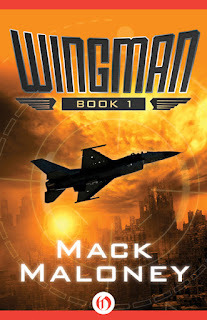 Mack Maloney's WINGMAN Novels Now Available as Ebooks! I read the WINGMAN series of post-apocalyptic aerial adventure novels in junior high and high school, and back then I thought they were the greatest novels ever written. A zany menagerie of characters battling on the ground and in the skies over a world devastated by the nuclear ravages of World War Three, the WINGMAN stories were filled with crazy adventures, battles on land, sea, and of course, in the air, as Hawk Hunter, "Zen Fighter Pilot" took to the skies in his customized F-16 fighter jet. I read about 10 of the 16 WINGMAN novels before I lost track of the series, probably around the time I went off to college. But I'd read and re-read the books I had - especially the first four or five novels - several times. As time went on, I would sometimes wonder what ever happened to the series, and it turns out it languished in out-of-print hell for a long, long time. But, like an F-16 rising up from the ashes of a nuclear post-war wasteland, the WINGMAN series has been given new life by the folks over at Open Road Media, a publishing house specializing in ebook publishing. They've given the series new covers and priced them competitively (smart thinking on their part), and as of today, the series is now live and ready for purchase on Amazon. I was fortunate enough to get in touch with Mack Maloney, the author of the WINGMAN novels, a couple of years ago, and after some correspondence back and forth Mack was kind enough to do an interview for me, which I published in Hatchet Force Journal. I've also been working with Mack to build a new home for him online, and it can be found here, on his new Wordpress blog. As time goes on, we'll be adding new information, but there are links to all his books, as well as a lot of other information. I've made D-Day posts here for a couple of years now (such as this post, and this post), and if you're reading this, it's a day that needs little explanation. The battle to take back Western Europe from the German army was a struggle of such epic proportions, it makes the Iliad look like a schoolyard scuffle. Although the Russians might have done the bulk of the fighting and killing of Axis forces over the course of the war (the vast percentage of German combat dead occurred along the Eastern Front), there really is no more iconic symbol for the fight to defend the free world from Nazism than the beach landings along the Normandy coastline. I've recently picked up Rick Atkinson's latest book, The Guns at Last Light, the conclusion to his Liberation trilogy (I wrote a review of the first book, An Army at Dawn). 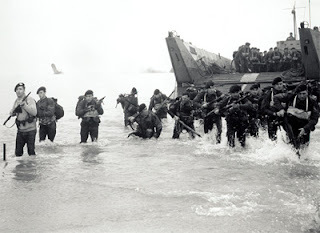 I'm going to take a moment today to begin reading Atkinson's work and reflect on the battle for Normandy, and I encourage everyone else to take a moment and imagine the sort of courage it must have taken to be in one of those landing craft - scared nearly senseless, soaking wet, weighed down by your gear and weapons, possibly about to enter combat for the first time. Whenever life throws a curve ball, it's worth it to take a moment, and ask yourself - compared to wading ashore hundreds of meters under a hail of mortar, artillery, and MG-42 fire, how does this stack up?